Dear Friends, it is a great honour to share some of the history of this special organisation. A 60th anniversary is such a milestone that it is celebrated with diamonds as we see in the decorations around us. I just have to advise that the diamonds on the tables are not real ones (sorry, folks). This is because the real Gadra diamonds are sitting on the chairs around the tables. And how beautifully this Gadra family is shining tonight. 60 years is a long time so let’s start with the basics. Firstly, Gadra was started in 1958. Just checking, that’s right? Okay so moving on, some of you with good memories will tell us that Gadra was started by a grand old lady of Grahamstown called Marjorie McKerron. Right? … Well actually no. Mrs McKerron played a huge role in Gadra as we shall hear shortly but she was more correctly called the “adoptive mother” of Gadra by no less an authority than Prof Winnie Maxwell, the legendary history professor at Rhodes. According to Prof Maxwell (who should be trusted to get her facts right), the honour goes to a founding father, the Rev Brian Knowles. Rev Knowles was a local Anglican priest who served as Rector of St Clement’s and a well-known voice of political conscience in the town. And to find out what prompted Rev Knowles we must go a little further back to another legendary professor at Rhodes, Prof James Irving of Sociology who is recognised as having inspired an entire generation of South African sociologists. Prof Irving went out into the field to research conditions in which people lived and he documented his findings carefully. When he published the details of how the majority of people in Grahamstown were surviving, it burst like a bombshell, shattering misconceptions and the complacency of the city’s establishment – town, gown, church and state. He documented shocking levels of unemployment and wages. However, it was his finding that 95% of African people in Grahamstown were surviving below levels of adequate nutrition and 85% lived seriously below these levels that galvanised action. Irving’s work provided more than just the spark that got Gadra established, it also set a pattern for what would follow in Gadra – namely work to understand the real-life problems of people as they lived their lives, and then finding practical ways of making a difference. He was fully aware of the debates that rage to this day about palliative versus developmental work when he said the most urgent need in Grahamstown was for school feeding. He was fully aware of the debates that rage to this day about palliative versus developmental work when he said the most urgent need in Grahamstown was for school feeding. He argued that although feeding alone would not solve the basic needs of the community, it would combat malnutrition until longer term interventions could be developed. This has pretty much been the Gadra two-stage agenda since then. Armed with this, Rev Knowles rallied the city’s great and the good. Under strong calls from united religious leadership, an Association was formed with the aim of relieving distress in Grahamstown and district and working with other like-minded agencies. It is at this point that Mrs McKerron comes into the picture, one of Rhodes’ first teaching graduates, a highly regarded school teacher and blessed with formidable energy and determination. The Gadra Schooling Feeding Committee began work with 800 children and R80. Her donor list grew rapidly – Archbishops, bishops, judges, lawyers, businessmen and Rhodes staff all signed up. She managed the books, planned the distribution and ensured that each child received a daily nutritious meal at a cost of R1 per term. In no time, the project was feeding 7 000 school children a day and she was a familiar sight at schools and pre-schools, known to the children as Ken Ngcoza has just told us, as Mrs McCarrots! She kept this up for 18 years, finally retiring when she was well into her 80s. Truly, she deserves the title of first mother of Gadra and the Honorary Doctorate awarded by Rhodes. So, it all started with feeding, but sometime during the 1960s it became obvious that poor families needed help to keep their children in school. Opportunities for black and coloured learning were very limited but dropping out was a major problem as children had to come to school with their own stationery supplies and set books as prescribed by the then Department of Bantu Education. Wrong kind of pencils and out you went. These materials cost R48 each year, a sum beyond the means of most families. in 1968 a new Gadra Committee stepped in, Educational Welfare, under the direction of Priscilla and Ron Hall, together with a local catholic priest, Father Edmonstone SJ. There were complications under the Fundraising Act for a second initiative under the Gadra umbrella that made things difficult and were to arise again later in the Gadra story. The ingenuity of the Halls in running the programme from their own home both politically and operationally was extra-ordinary. School pressures, protests and disruption entered Grahamstown earlier than elsewhere and in 1975 the burdens on learners and their families reached breaking point. The Halls and other committee members worked feverishly in mediation and then set up alternative teaching sites when police casspirs arrived. Ken Ngcoza was at school then and taught his classmates maths. Similar scenes were to take place in the early 1980s and again Gadra leadership sought to mediate and protect learning in highly volatile times. The frontlines were closing in across South Africa and in the coming years, Gadra leadership and staff in all its divisions were to play their part with great courage to keep communication open and practical assistance available. By the 1970s, Family Aid had been identified as another urgent need – food packages and assistance as well as advice for vulnerable people especially pensioners. Thus, a third arm of activities came into being at Gadra. Rosemary Smith worked as a Gadra social worker for 14 years initially in a prefab building in Raglan Road. People in their hundreds poured into the Advice Offices. She describes the work in her book, Swimming with Cobras as “a kind of war we were waging, not just against the callous government policy (of apartheid and racial discrimination), but most often also against an obstructive and vindictive bureaucracy”. Poverty, unemployment and exclusion remained the huge challenges and Gadra continued to work to bring relief while also wrestling for longer term solutions. Gus MacDonald, another stalwart social worker and long-time chairman of Gadra Advice recalls that the demand was such that the ceiling for Family Aid was set at income of 5c per day per family member. The people of Gadra then, as now, worked up against the roughest and rawest edges of government policy with compassion, respect and the utmost professionalism. No wonder Gadra became a household name across the city. In 1975 a newcomer to Grahamstown was invited to join the Gadra committee in the role of “co-opted observer”. Anyone who knew Thelma Henderson would not be surprised to discover that she did not remain in that role long. In 1976 she became the chairperson of Gadra Educational Welfare, a position she was to hold for the next 30 years. She extracted the bursary files from Father Ed as he was commonly known. Rosemary Smith records that he kept all the paperwork in cardboard boxes under his bed at St Patrick’s Church – quite how Rosemary knew this I can’t say, but anyway, the work was transferred and very soon the Henderson machine was running at full speed. She worked from home, meeting all the responsibilities of growing the fund, selecting and supporting scholars around the dining room table. Edward Matama, who had done a lot of this work before and had established a township-based book recycling project for Gadra in the 1960s, was a frequent visitor to our home and a real support. The first recruit to help with the soon burgeoning bursary fund was my sister, Angie Marriner. Angie remembers the piles and piles of letters, bursary applications, supporting documents and correspondence all meticulously filed, sorted, processed and stored. Significantly, neither my father nor I were invited to assist. There was a simple reason for this – both of us handled paper in the tradition of Father Ed and his cardboard boxes! This was the biggest bursary programme in the Eastern Cape. Stakeholders of every kind served on the Gadra committees. By the mid-1980s, Thelma had an office and a team supporting Gadra Education in the new Centre for Social Development that she established at Rhodes. The files moved, and the work continued. Bearing in mind Prof Irving’s focus on long term solutions, she began to create agencies for transformation as well as growing the bursary programme to provide support for university study, teacher training and practical skills. Between 1977 and 1991, over 5880 young people from Grahamstown and surrounds had been assisted and spend on bursaries had grown from R15 000 a year to R230 000. This was the biggest bursary programme in the Eastern Cape. Stakeholders of every kind served on the Gadra committees and worked jolly hard among them Joan Valentine, Marcus Parsotam, Edward Matama and Olive Ngesi. The principle of representivity so embedded in Gadra today dates from these times. Multiple programmes followed – winter schools and teacher training workshops, as well as a highly innovative programme with the Discovery Channel and computer-based science and maths learning. Sadly, the latter two lasted only a few years. 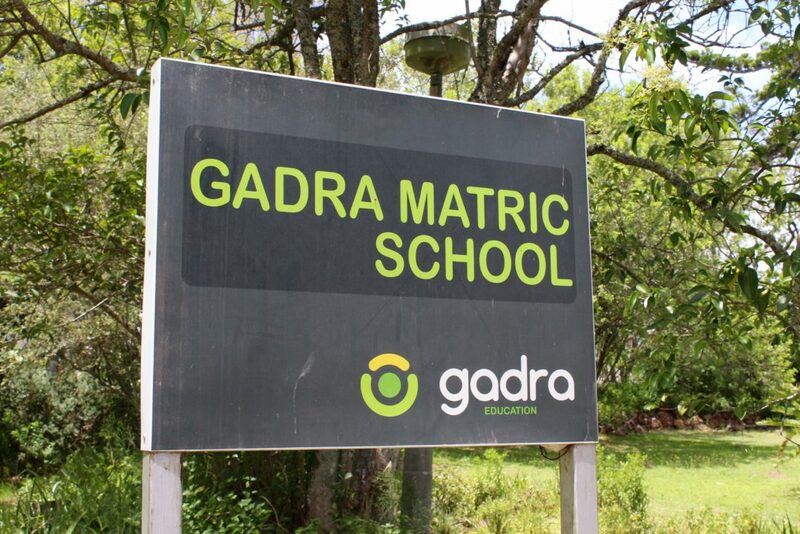 The real bastions of the transformative work by Gadra Education were the city’s first non-racial Commercial College (established in 1987) and the Gadra Matric School (early 1990s). Nollie Shelle and Peta Meyer were critical in this work for years. At the same time, Gadra itself was also diversifying. School feeding stumbled and was phased out, but Family Aid grew into a complex of service programmes under the title of Gadra Advice and Community Work and there were new programmes in two other sections – Feeding and Relief, and Development. A formidable team of people including Adrienne Whisson, Peggy McCoy, Jeanette Hodgson, Margie Antrobus and Julia Mann provided a range of support services. Kolokela Nkwinti ran the Development arm. Thus it was that Gadra served the widest set of needs for the greater city community during the darkest days of the apartheid, the 1980s. Things were tough and there were great stresses. The advice offices in Raglan Road burnt down following protests at the neighbouring Beer Hall in 1985, but insurance money and donations enabled the organisation and its growing number of partner organisations to open a dedicated centre on leased land at the Day Hospital in Cobden Street. With such a broad spread of needs to meet, the pressures that had bedevilled the Halls’ work previously grew and the 1958 structure creaked. Balancing the needs of all the divisions was complicated so the practice was adopted of running the Gadra street collection on a rotational basis with whoever got that funding, reciprocating by hosting the AGM. Feeding and Relief was given first dibs at the generous university base, with other divisions waiting for later in the year to recruit Rhodes staff as donors. Gadra Education acquired precious 18A status but was not able to share this with the others as it was then limited by SARS to educational projects. All Gadra work was urgent, but funding was tight, and relationships suffered. Uncertainty over the democratic transition also impacted on donor willingness to fund welfare work seeing it as the responsibility of the new government. In 1995, after extensive engagement, mediation interventions and structural reviews, the two Gadra Divisions of Feeding/ Relief and Development exited Gadra to go their own way under a new name. Advice and Education remained with a shared commitment to the Gadra brand. Woineshet Bischoff, Yvette du Plessis, Pauline Mitchell and Roger Domingo all assumed leadership roles in Gadra Advice bringing new fundraising skills and moving on in time to leadership in other NGOs. Things settled down and the 1997 AGM noted “an uncomplicated, happy and purposeful atmosphere prevailed”. Prof Terence Beard chaired the Advice Committee and Mrs H the Education Committee. She also chaired the over-arching Gadra central committee until retiring in 2006. Life for NGOs in South Africa is never easy, and the first decades of the millennium have brought their own stresses and strains to both Advice and Education. Gadra Education had a close call seven years ago, but timely interventions and new leadership saved the day. Sadly, a few years later the same operational and financial storms swamped the Advice boat and it was forced to close. Melanie Lancaster has been a super star principal of the acclaimed GMS for more years than she cares to remember and Gadra is proud of its two Citizens of the Year – Melanie and Ken. The Gadra brand remains strong and under the leadership of Ashley Westaway, Gadra Education has entered a new era. Melanie Lancaster has been a super star principal of the acclaimed GMS for more years than she cares to remember and Gadra is proud of its two Citizens of the Year – Melanie and Ken. Leadership by Prof Paul Walters and Prof Ken Ngcoza has brought a new character to committee meetings while the Gadra staff work with determination and purpose behind their friendly and helpful smiles. Gadra Education is an organisation shaped, led and sharpened for its times. It leads the way nationally and locally and has fostered amazing partnerships aimed at transforming schooling in our city for everyone. The GMS is now entrenched as the biggest feeder school to Rhodes, while Gadra’s other work has grown strong relationships across the city, with multiple partners and schools. Its biggest and most rewarding role must be in running the VC’s Schooling Programme at Rhodes and in helping implement innovative projects like the 9/10ths grade 12 mentoring and Whistle Stop School reading programme which are recording radical attainment in the nation’s most “wicked” (consultant speak for “stubbornly resistant”) schooling challenges. And so, we have come full circle in 60 years. In 1958 Gadra came to be from an unlikely blend of proactive university research and civic leadership, to produce a home-grown model of activism and care in an organisation dedicated to working with all the citizens and agencies of this town. The spark provided by Prof Irving has multiplied over the years and is now reflected in the blazing torches of transformation carried by the student volunteers, the GMS teachers, the WSS trailblazers, the Gadra project teams and the partner schools. Margie Keeton is the Treasurer of the Gadra Education Board. The 60th anniversary celebrations of the organisation took place in the Drill Hall, Grahamstown (Makhanda) on Wednesday 8 August 2018.